Carbohydrates have gained a bad reputation in recent years. Say the word ‘carbs’ and for many people, stodgy food and weight gain spring to mind. But in reality, your body wouldn’t be able to function without them. What’s important, is to eat the right type and amount of carbs. Not all carbohydrates are the same. There are different types of carbohydrate. Sugar. Sugar is found naturally in some foods, such as whole fruit and vegetables, milk and dairy products. There’s no need to limit these natural sugars in your diet. Sugar is also added to some foods, such as sweets, biscuits and fizzy drinks during their manufacture. It’s these added sugars, also known as free sugars, that can be harmful to your health and should be eaten only in moderation. Starch. Starches are made up of a number – sometimes hundreds – of sugar molecules joined together. They’re found in bread, pasta and rice, as well as some fruits and vegetables. Fibre is also classed as a carbohydrate. Although your body doesn’t use it for energy, it helps to keep your bowel active and healthy. Why do carbohydrates have a bad reputation? Say the word ‘carbohydrates and many people will immediately think negative things. Carbohydrates are blamed for everything from feeling tired and bloated to a perceived heaviness. It’s also a common misconception that carbohydrates are fattening. Some diet plans, such as the paleo diet (also known as the caveman diet) and the Atkins diet are based on reducing the amount of carbohydrate you eat. For more information on these, take a look at our advice on fad diets. It’s not unusual to think of cakes and stodgy food when carbohydrates are mentioned but carbohydrates aren’t all the same. 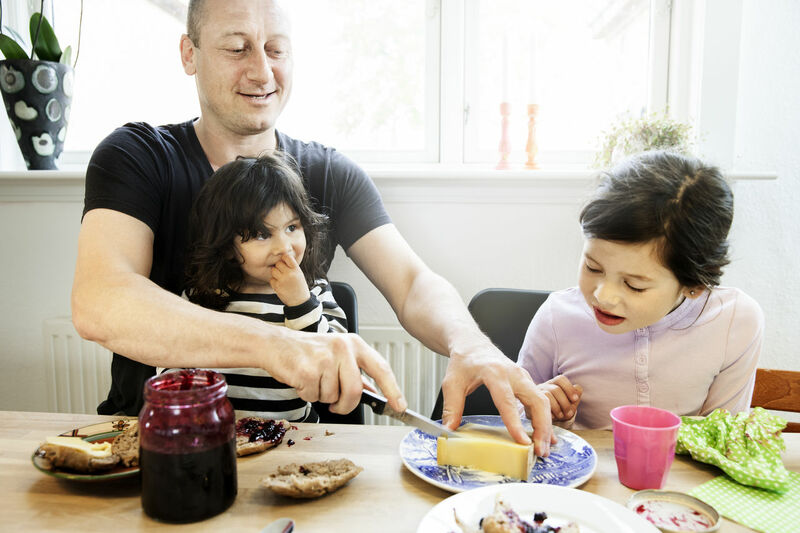 Low-carb diets often don’t leave room for the carbohydrates in fruit, vegetables and wholegrains, which are essential components of a balanced diet. It’s the added or ‘free’ sugars found in biscuits and fizzy drinks and the like that give you a sugar rush and can cause problems. Your body processes such sugars very quickly so they don’t sustain your energy levels. You should aim to eat less of these. See ‘What is the glycaemic index?’ below for more information on how quickly carbohydrates are broken down. Carbohydrates do contain calories but less than half the number found in fat. Of course, as with lots of things, it’s not good to have too much. If you eat more carbohydrate than your body can burn off as energy, the excess will be converted to fat. But carbohydrates are an essential part of a healthy diet. Rather than eliminate carbohydrates from your diet, the key thing is to eat the right type of carbohydrate because some are healthier than others. ‘Good carbs’ are the wholegrain varieties of starchy carbohydrates. These include things like wholegrain bread and brown rice, as well as potatoes (with the skin left on). High-fibre, starchy carbs release sugar into your blood more slowly than sugary foods and drinks. This makes such carbohydrates an important source of energy. The natural sugars found in whole fruit and vegetables, milk and dairy products also count as good carbs. These foods also contain other important nutrients such as vitamins. Wholegrains contain a host of important nutrients that may reduce your risk of heart disease and some types of cancer. When grains are processed to make them look whiter, the part of the grain that contains fibre and many useful nutrients is removed. This means that white bread, pasta and cereals aren’t as good for you as the wholegrain varieties. Wholegrains are also more likely to keep you feeling fuller for longer. This is because they contain more fibre and generally take longer to digest than processed foods. This can help to control your appetite and maintain a healthy weight. See ‘What is the glycaemic index?’ below for information on how quickly different carbohydrates release sugar. Sugar is often referred to as a ‘bad carb’. But it’s important to remember that it’s the added or ‘free’ sugars found in processed foods that can cause problems. This includes things like biscuits, fizzy drinks, chocolate and cake. Processed foods and drinks that contain free sugars contribute to your energy intake but have little other value. Not only that, they’re often very energy dense, which means they pack a lot of calories into a small volume. Some of these foods also contain a lot of fat but not many other useful nutrients. The calories they contain are often called ‘empty calories’ because of the lack of nutrients. Even if you eat just small amounts of sugary foods and drinks, they can push up your calorie intake remarkably quickly. In fact, sugary drinks are the main reason many of us consume too many empty calories. Free sugars are naturally present in honey, syrups and fruit juices so it can be confusing to understand what’s good and bad. What’s important is to be aware of these free sugars and not to consume too many of them. Try to limit your intake of ‘bad’ sugar carbohydrates and stick to ‘good’ starchy foods where possible. For more information on how to cut down on your sugar intake, take a look at our sugar-swap videos. Aim to make starchy foods – ideally wholegrain starchy carbohydrates – about a third of your diet. So include things like wholemeal bread, brown pasta and rice in every meal, as well as some fruits and vegetables. Most of us are already eating enough carbohydrate, but often the wrong type. Too many calories come from sugary products and not enough from wholegrain, starchy foods. 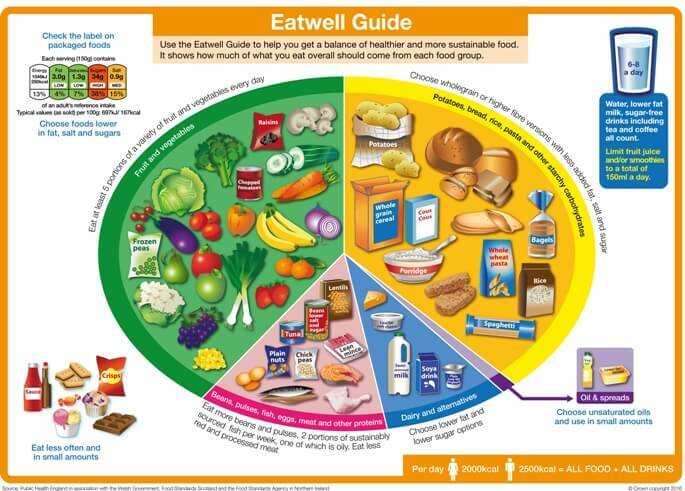 Use the Eatwell Guide below, which shows the recommended proportions of each food group. Your exact needs change as you go through the different stages of life. You can read more about this and why different age groups need more or fewer carbohydrates in our topic: Diet throughout life. The glycaemic index (GI) is a measure of how quickly glucose in food is released into your bloodstream after you eat it. It’s used as a rating system for foods that contain carbohydrates and shows how quickly each food affects the sugar levels in your blood. Low-GI foods cause blood sugar levels to rise and fall slowly, so you feel fuller for longer. These include wholegrain foods, some fruits and vegetables, beans and lentils. Although it’s a good idea to include low-GI foods in your diet, don’t use this measure alone to decide if a food is healthy. For example, parsnips have a high GI, while chocolate and ice cream have a lower GI. Obviously, parsnips are much the healthier option! Bear this in mind if you’re relying on the GI value to decide if foods are healthy or will help you to lose weight. Consider the bigger picture! Some people can’t digest certain carbohydrates, and this is called carbohydrate intolerance. The carbohydrate most commonly involved is lactose (the sugar found in milk and dairy products). The inability to digest lactose is called lactose intolerance. If you’re intolerant to carbohydrate, you might get symptoms such as diarrhoea, bloating, and wind when you eat them. If you have any of these symptoms, contact a dietitian. It’s a good idea to keep a food diary before your appointment so you can pinpoint what causes your symptoms. You’ll need to stop eating the type of carbohydrate that causes you problems. Your dietitian will help you figure out how to do this and which foods to avoid, and how to top up with alternative carbohydrates. If you want to lose weight, you need to increase your physical activity and watch your calorie intake. Bupa's calorie calculator will help you to work out how many calories you're burning in a day.